Q&A with staff from the Council of Europe Education Department about the new Competences for Democratic Culture framework. What is a culture of democracy? Democracy depends on institutions (e.g. parliaments, city councils) and laws (e.g. the constitutions but also due process in courts) as well as procedures, e.g. elections. All of these are essential elements of democracy. However, parliaments, laws and elections do not in themselves make societies democratic. They will only work if they are rooted in what we call “democratic culture” or “a culture of democracy”. “Democratic culture” designates the set of attitudes and behaviours required to make democratic institutions and democratic laws function in practice. Examples of such attitudes and behaviours are solving conflicts through peaceful means; participating respectfully in debate, which involves both listening to others with an open mind and forwarding one’s own arguments respectfully; and obtaining information from a variety of sources with a critical mind. It does not mean accepting all views and arguments as equally valid. Some values are absolute, and many of these are found in the European Convention on Human Rights. Competences for democratic culture are therefore essential for building the kind of society in which we would like to live, and in which we would like our children and grandchildren to live. “Competences” describe what a person knows, understands and is able to do, as well as the person’s values and attitudes, i.e. not only what a person is able but also willing to do. Including values and attitudes in democratic competences is important because they may orient a citizen’s action: there are things we may be able to do but that we should, for moral and ethical reasons, refrain from doing. Democratic culture is not like riding a bicycle but like speaking a language: if you do not practise it, you will lose the ability. 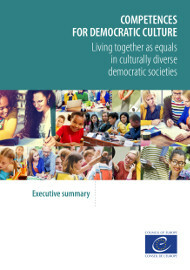 Developing and maintaining competences for democratic culture is therefore a lifelong challenge. Furthermore, competences for democratic culture apply to every aspect of life, professional or social, offline or online. What is the purpose of a reference framework for the development of competences for democratic culture? How do you describe competences? Competences will be described using a set of descriptors that can be used in schools, universities, and other education settings to review and develop curricula, study programmes and pedagogy required to help students become active democratic citizens and to assess their progress. These descriptors are currently being piloted in concrete learning contexts. Those descriptors that are found to be effective in teaching and learning competences will be published as part of the reference framework. Can you give an example of a descriptor? When will the reference framework be available? The reference framework will be available once it has been approved by the Council of Europe’s Steering Committee for Educational Policy and Practice at the end of this year. Further development and implementation will continue in 2018 and beyond.